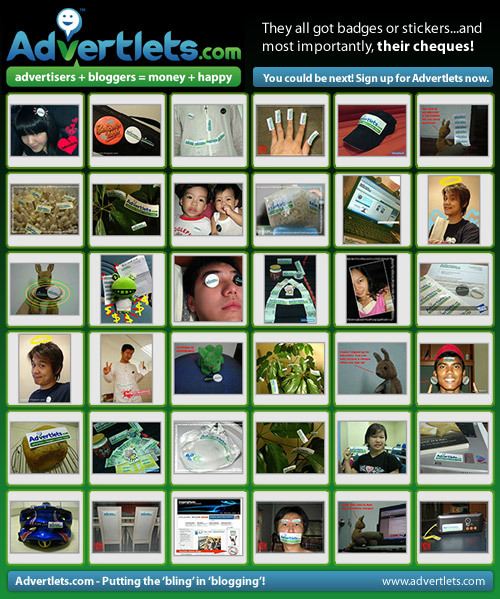 I’ve been a member of Advertlets.com since 12 April 2007, says the site’s Earnings section. I’ve also earned exactly RM10.85 as of tonight, a notable improvement from the RM10.15 last time I checked. Obviously, I run Kuching’s most popular blog… visited by an average 15 people a day, including a couple of cats, some crickets and people Googling for someone else. But what I do like about Advertlets (in a sincere, I’m-not-trying-to-improve -my-chances-of-earning-20-bucks-for-making-this-post way) is that they are quick to acknowledge East Malaysia as an existing demographic where blogging power is concerned. The first event that took advantage of those of us in East Malaysia was the DiGi Fu-yoh! Street Blast event in June. Almost went for it, but I knew I had to actually work the same event. Next time! And look at the image below. 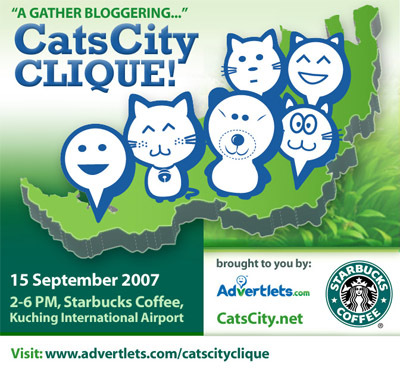 If you’re familiar with your local bloggers, you’ll notice quite a few Kuching ones in it. I’ve met a good number of new bloggers in various meet-ups but it’s always nice to meet some more. Anyway, I haven’t been bothered to go check out Starbucks so having someone else buy my drink is a good incentive to go! See you there!